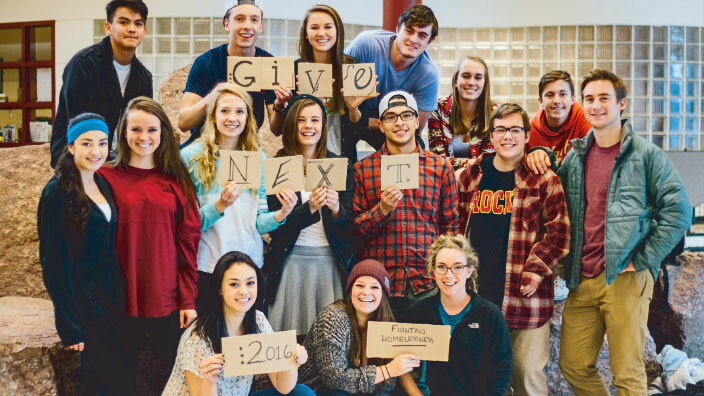 Give Next is a school-based program designed to provide middle and high school students with hands-on experience in philanthropic giving. Give Next’s mission is to educate students about the vital role that nonprofits and philanthropy play in their community. Through the program, local businesses, foundations and individuals become classroom donors by providing each participating school with $5,000 to award to nonprofits in Larimer County, Colorado. With the financial support of these generous donors, students design and manage their own grantmaking programs. Students experience first-hand the power of teamwork, the impact they can have on their community, and the rewards of giving time, talent, and treasure. This year-long program begins with Give Next Kickoff Day, a day of information and inspiration. Back at their schools, students work together to identify community needs, choose a focus area, create a mission statement, research nonprofits, volunteer, conduct site visits, review grant applications and make funding decisions. At the end of the school year, students award grants to selected nonprofits. Give Next is made possible through the support of many community partners. Primary program implementation partners are Bohemian Foundation and the Community Foundation of Northern Colorado.